There’s something about the hilly, cobbled classic of Koppenbergcross that challenges the favorites and, at times, favors the challengers. 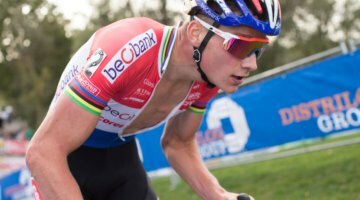 Sure, Mathieu van der Poel (Corendon Circus) overcame a disappointing 2016 showing to win in 2017, but the long, cobbled climb turns the race into more than just a display of pure power or bike handling skills. Early on, three-time winner Wout van Aert (Cibel-Cebon Offroad) looked to put his stamp on the race and show he was ready to overcome Van der Poel’s dominance this season. Could he add a fourth cobblestone trophy to his case? Van Aert followed Toon Aerts’ (Telenet Fidea) sprint up the Koppenberg on lap one, and much to his surprise, saw his nemesis Van der Poel far back. Halfway into lap one, Aerts, Van Aert, Quinten Hermans (Telenet Fidea), Daan Soete (Pauwels Sauzen) were not waiting for the Dutch star to join the front, while Marcel Meisen was left wondering why he was the lead rider on the Corendon Circus team, with his team leader trailing, sitting outside the top ten. 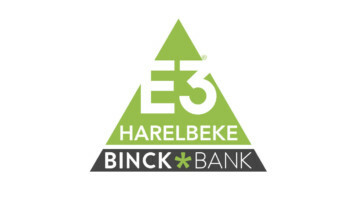 Michael Vanthourenhout (Marlux Bingoal) and Eli Iserbyt accelerated to join the lead group paceline, while Van der Poel slowly picked off riders. Fans waited for the inevitable. Perhaps today it would be only delayed a lap? Van der Poel was coming, and had the leaders in sight the second time up the cobbled ascent. 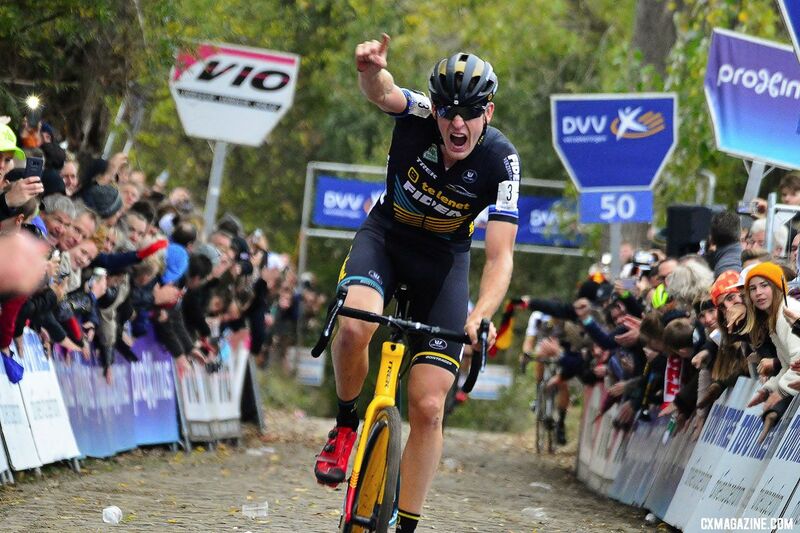 Semi-rideable climbs tend to be Van der Poel’s strength, but on lap two, a short, steep riser saw him falter, dab and drop his bike. The bobble cost him seconds, but seem to deflate his motivation. With two laps down, Van der Poel was 20 seconds down. 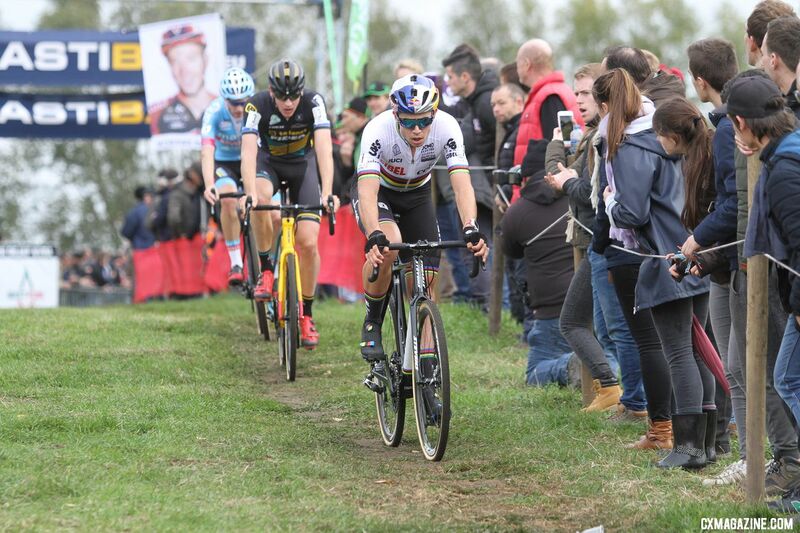 At the front, the deflating moment for Van der Poel put wind in Van Aert’s sails. The World Champ hammered away to ensure his rival wouldn’t rejoin the leaders. Aerts and Vanthourenhout hung on, while the rest were left inhaling dust from the Belgian trio and relatively dry conditions. 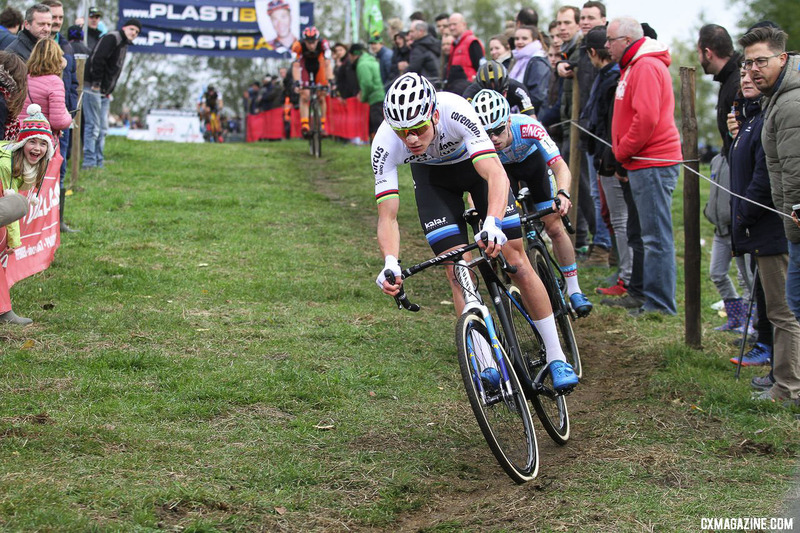 Van der Poel put in one more hard lap giving chase, but after three laps, the gap was the same, and just as he did in 2016, he would shut it down and fall far back. 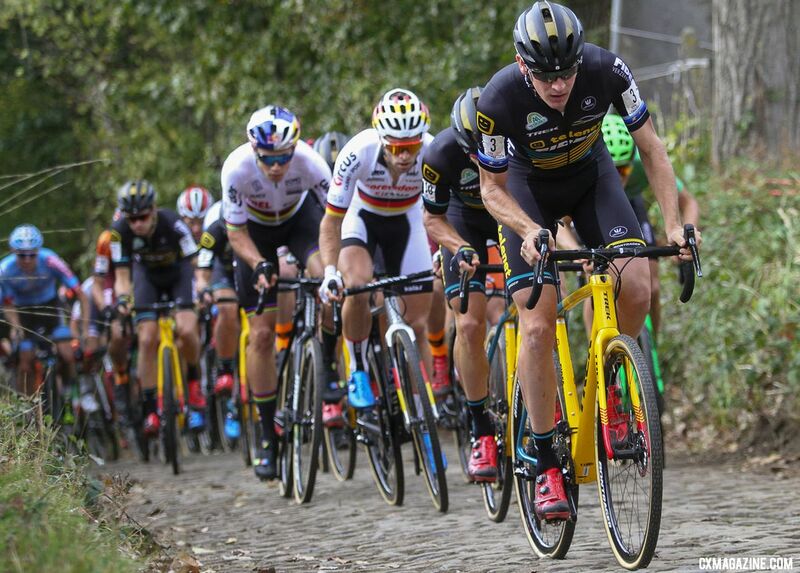 The final trio was set, and with one to go, Aerts put his companions on the defensive, attacking the penultimate Koppenberg climb, drawing out Van Aert and gapping Vanthourenhout. 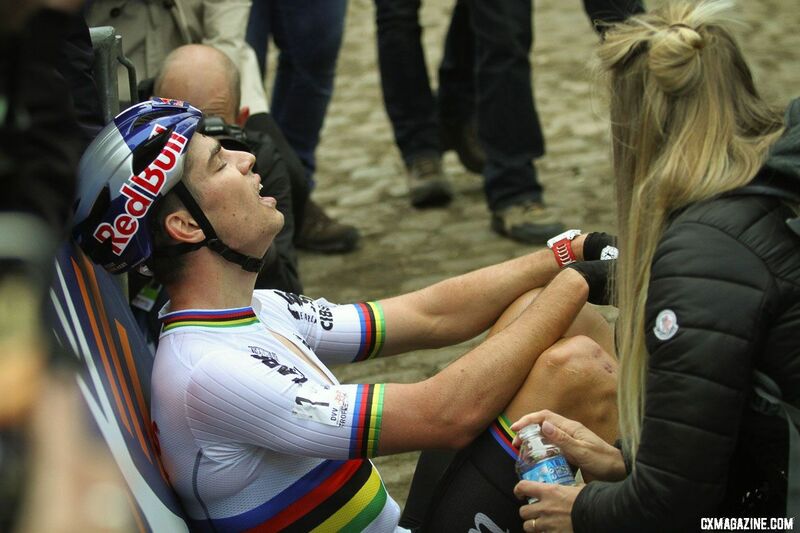 Did Van Aert have enough left after his early attacks for one more effort? Aerts made sure Van Aert was done, leaving him in his all-t00-familiar second position, with Vanthourenhout threatening a further downgrade. On the final ascent, Aerts bounced up the cobbles to victory before collapsing, adding to his already-impressive two World Cup-winning season, while Vanthourenhout overtook Van Aert for second. 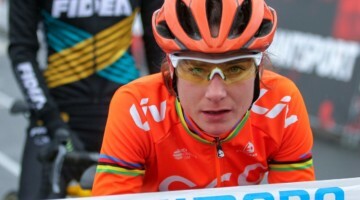 Van der Poel would finish 21st. Full results and photo gallery below. 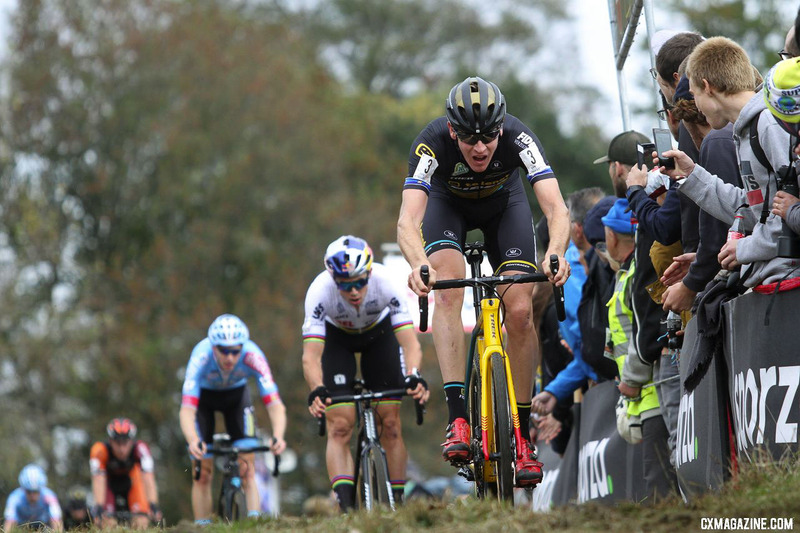 Next post Race Preview: 2018 Really Rad Festival of Cyclocross UCI C2 in Falmouth, Mass.